Mariposa’s surfing program, led by our very own graphic designer and surfing mentor, Pamela Cuadros, gives the strongest swimmers a chance to do what so many foreigners come flocking to Cabarete beaches to try. Despite living a stone’s throw from the ocean, more often than not in the Cabarete community, young girls are not taught how to swim and often grown up fearing the water. Our swim and surf programs empower our Mariposas, making them see that they are just as capable, strong and worthy of a passtime like surfing as the local boys and the foreigners who come on vacation to their hometown. Before letting them get out there to ride the waves, we make sure our girls are fully prepared. One of the most important things we do here at Mariposa is make sure all of our girls become strong swimmers. The youngest girls start off in our pool, getting the basic strokes down and learning to love the water. Once they’ve made it to a certain level, we take them across the street from our center to the beach, to learn integral ocean safety, such as how to identify and escape from riptides. During our summer camp months, Pamela takes the experienced surfers out into the waves daily, preparing them for upcoming surf competitions. She also takes a new batch of surfers out twice a week, helping them learn the basics and fostering their love of the sport. As if born to surf, many of the girls take to the surfing instantly, and sometimes win local competitions. The surf program also goes hand-in-hand with our environmental and sustainability initiatives. Before getting geared up, the surfers always take time to clean up the beach, clearing trash and collecting debris in recycled rice bags. This morning routine has solidified the understanding that loving the ocean also means protecting the ocean. This is how genuine environmental social change begins-- by bringing the next generation out into nature and sparking a life-long love. Our surfers have also had the chance to ride and learn alongside some amazing professionals! 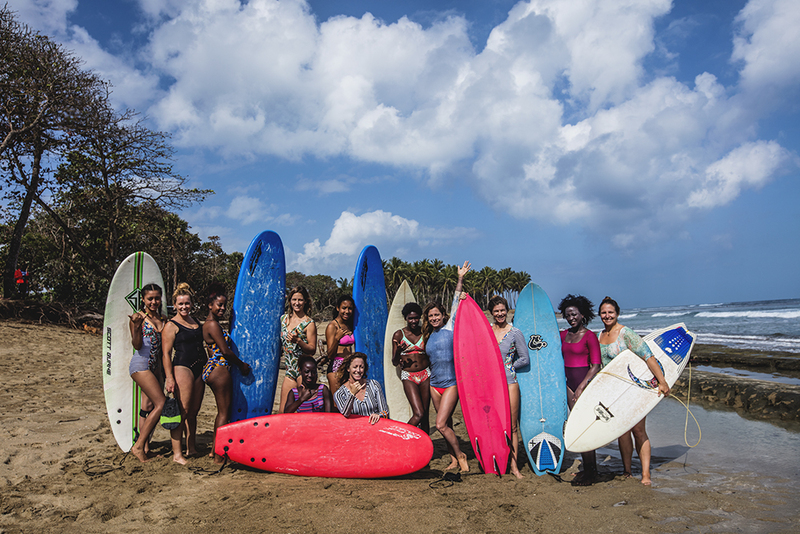 In March, The Changing Tides Foundation, a group of water women and adventurers who feel their calling is to help others, came down to Cabarete through their Women’s Outreach Mentorship Program. They swapped tips and tricks, explored the local waterways and gifted our girls a ton of amazing surfing gear. The Changing Tides women even made a little history while they were here, surfing a the biggest swell in Puerto Plata in 30 years! Surfing has given our girls confidence, strength and the opportunity to do something fun and empowering out in their natural surroundings. The chance to see other women achieving extraordinary feats of athleticism out on the waves and then attempt them themselves has empowered the Mariposas, inspiring dreams and aspirations of surfing at that high level. But until they do move on to wilder waters, if you head down to Encuentro beach on a typical summer morning, you will see the bright, fluorescent pink wetsuit shirts of the Mariposas, bobbing up and down in the rolling surf-- riding the waves and holding their own right alongside the very best surfers from around the world.